Linfield boss Warren Feeney says his players have a fantastic opportunity to make history in their Europa League second leg at home to Spartak Trnava. The Irish Premiership side trail 2-1 from last week's game in Slovakia and defender Sean Ward returns to the squad after missing that game. "The away goal is massive for us because I fancy us to score," said Feeney ahead of Thursday's game. "But they are a powerful full-time outfit and we must be cautious." The team which progresses to the third qualifying round will play Lokomotiv Zagreb from Croatia or Greek side PAOK. Linfield felt they were unlucky with some crucial decisions during the first leg, in particular the ruling out of a Chris Hegarty goal for offside. New signing David Kee got the Belfast side's valuable away goal with a superb free-kick. 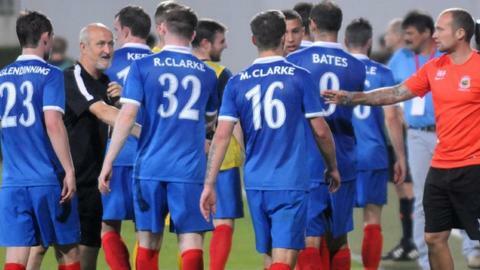 "We are still the underdogs and they will know what we are about after the first leg," added manager Feeney. "But it is a fantastic opportunity to make history." Linfield, who beat Faroe Islands side NSI Runavik 5-4 on aggregate in the first qualifying stage, have never made it through two rounds in the Europa League.